We invite one of electronic music’s most exciting selectors to Room One as Hunee lands this April. Known for both his matchless persona and collection of sublime dance cuts, Hunee’s eclectic sets can take in soul, funk and disco, threaded together with an understated finesse. UK artist Palms Trax also joins us. One of today’s most singular producers, Jay Donaldson’s shimmering deep house cuts have most recently landed on the exceptional Dekmantel label. Rising producer Suzanne Kraft finally brings his breezy LA sound to round off the bill. Advance tickets are now on sale via RA, including limited pre-midnight tickets available at £10 off the door price. 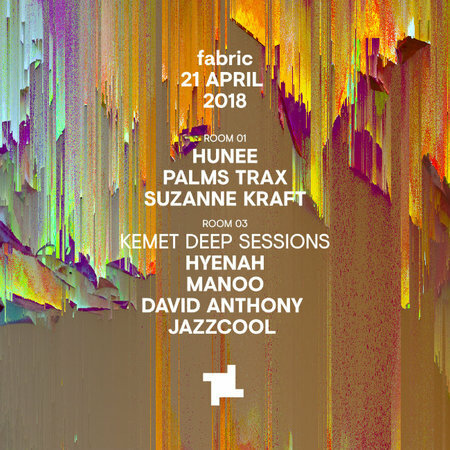 Artists / Speakers: Hunee, Palms Trax, Suzanne Kraft. 2nd release (priority entry before 1am): GBP 21.0.